^ "Will Poulter looks relaxed at 2019 Bafta nominations after quitting social media over Bandersnatch reaction". Metro. 9 January 2019. Retrieved 9 January 2019. 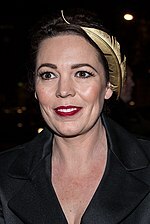 ^ "Bafta Film Awards 2019: Olivia Colman's The Favourite leads nominations". BBC News. 9 January 2019. Retrieved 9 January 2019. ^ a b c "EE British Academy Film Awards: Venue and host announced for 2019". British Academy of Film and Television Arts. 2 January 2019. Retrieved 2 January 2019. ^ "The full list of nominations for the Baftas 2019". The Guardian. 9 January 2019. Retrieved 9 January 2019. ^ a b c d "EE British Academy Film Awards Winners in 2019". British Academy of Film and Television Arts. 10 February 2019. Retrieved 10 February 2019. ^ "Baftas 2019: Roma and The Favourite win big – as it happened". The Guardian. 10 February 2019. Retrieved 10 February 2019. 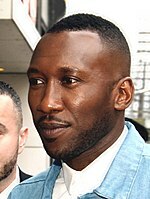 ^ Clarke, Stewart (6 February 2019). "BAFTA Suspends Bryan Singer's Nomination for 'Bohemian Rhapsody'". Variety. Retrieved 6 February 2019. ^ French, Alex; Potter, Maximillian (23 January 2019). "'Nobody Is Going to Believe You'". The Atlantic. Retrieved 23 January 2019. ^ a b "Two time BAFTA-winning editor Thelma Schoonmaker to be honoured with BAFTA Fellowship". British Academy of Film and Television Arts. 24 January 2019. Retrieved 24 January 2019. ^ a b "Number 9 Films Stephen Woolley and Elizabeth Karlsen to receive the BAFTA for Outstanding British Contribution to Cinema". British Academy of Film and Television Arts. 16 December 2018. Retrieved 16 December 2018. ^ McCreesh, Louise (10 February 2019). "BAFTAs' Joanna Lumley throws shade at the Oscars hosting debacle". Digital Spy. Retrieved 10 February 2019. ^ Westbrook, Caroline (10 February 2019). "What time are the Baftas on BBC One tonight and is the ceremony shown live?". Metro. Retrieved 10 February 2019. ^ "Yorgos Lanthimos 'The Favourite' takes home seven BAFTA Awards". Greek City Times. 10 February 2019. Retrieved 10 February 2019. 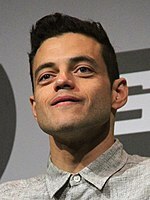 ^ "Rami Malek thanks Freddie Mercury as he wins best actor Bafta". Irish Examiner. 10 February 2019. Retrieved 10 February 2019. ^ Mullen, Adrian (11 February 2019). "Sax star Jess Gillam lifts the roof at the BAFTA's at the Royal Albert Hall". The Mail. Retrieved 11 February 2019. ^ a b c d e f g h i j k l m n o p q r s t u v Sheehan, Paul (9 February 2019). "2019 BAFTA Awards: Who is hosting and presenting, which nominees will (and won't) be there?". Gold Derby. Retrieved 9 February 2019. This page was last edited on 28 March 2019, at 21:20 (UTC).